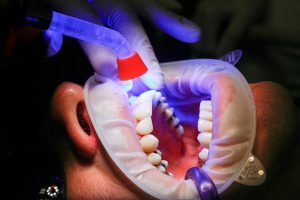 Home > Blog > Are Dental Bondings/Fillings Right for Me? Are Dental Bondings/Fillings Right for Me? The most common damage people experience in their teeth is cavities. Through a combination of the bacteria in our mouths and the diet of sugars and acids we consume, cavities form in between our teeth. While brushing and flossing helps maintain a healthy smile, many people will get at least one cavity during their life. Luckily, the treatment for cavities has improved over time along with general oral health. In most cases, your dentist can take care of any cavity you have within one visit. They fill the cavity in your teeth using a filling material, and once hardened, it anchors the tooth and protects it against any future damage. Cavities occur when bacteria builds up in the teeth. The bacteria eats away at the enamel and tooth body, creating a cavity. When the dentist discovers that you have a cavity, the damage is removed with a drill. The remaining tooth structure then has to be filled in somehow. This is where a filling comes into play. The space in the tooth is filled by some material, most commonly composite. This milky white substance is packed into the space, then hardened using a UV light. Finally, the filling material is polished so it fits into your bite and against your other teeth. This process is very common and can be done quickly. Fillings can also be done with other materials. Older people may remember silver amalgam fillings. These fillings were strong and effective, but left unsightly dark spots in the teeth. Other options include gold. Gold, while being expensive, is a great material for fillings because of its strength and durability. Outside of the cavities mentioned before, fillings can be used to treat other minor damage. For example, if a tooth is chipped from trauma, a filling might help the damage without resorting to more costly methods, like crowns. Especially given the similarity in color that composite has with your natural teeth, this material is a great way to fix cosmetic problems in your teeth. Unfortunately fillings are not permanent. While they can last for years, certain older fillings might eventually have to be replaced. Older fillings, like amalgam, can be switched out for composite fillings or even porcelain ones. Fillings are one of the most common dental procedures in the world. They are a versatile, easy procedure that can help protect against and repair damage. If you believe you have cavities or want to get some repair work done on your teeth, contact us at Hassey/Do Duy today. Our dental professionals will help find the right solution for your needs!